In yesterday's post, I noted that trading below 2,335 in the S&P cash would start to signal a problem, and the count of a diagonal in the major indexes. Today, I'd like to show you where that calculation comes from. The S&P500 4-hour chart below, now has the needed 120 - 160 candles to be indicative of The Eight Fold Path methodology. It actually has 185, but any lower time frame results in too many candles, and any higher time frame results in too few. The count below is one that was established as an alternate on the ES E-mini S&P 500 futures. This is just the extension of that count to the future. At this exact point in time, it should be seen as an "equal alternate" to the counts shown yesterday. SP500 4-hr Chart : Last Chance Fourth Wave? The rationale for this potential count is that usually, most-often, fourth waves and second waves can travel a similar net amount. The black rectangle shows the total number of points traveled in wave 2, from low to high. And, the blue rectangle is just a copy of the black rectangle and shows a near exact measurement for a wave 4 at this level. This morning cash hit 2336.45, narrowly missing that 2335 level. This count would provide the needed alternation for an impulse, as wave 2 would be the sideways holiday trading, counted as a double combination w-x-y, with the y wave as a triangle, and wave 4 would be a sharp - and simpler - (zigzag) correction. At a level of -16, the Elliott Wave Oscillator is just barely hanging on to a -40% of the peak of +40-2 on this chart. A UBS strategist said it well this afternoon (paraphrase), "the market has decided to make this vote on health care the decider as to whether a further correction begins here or not". 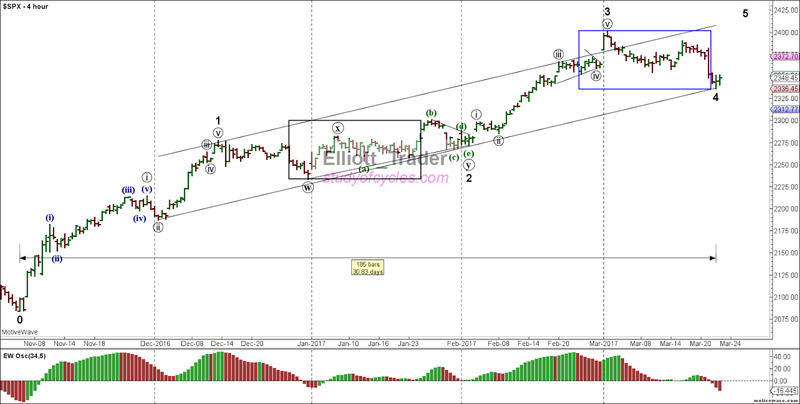 In this count wave 3 is shorter than wave 1, so a wave 5 would have to remain shorter than wave 3. And, by way of invalidation, in no case, could a wave 4 overlap wave 1 (in this count). As I said in my weekend video having clear alternates - and clear rationale for them - is an item that helps keep an Elliott analyst's ego in check. Breathe. Enjoy. Stay patient and flexible. If you watched my weekend video, you might see some patterns here that look familiar. If not, might want to watch it a second time - with popcorn! By the way. We know that the five waves up to (c) at 2389.70 on FED day, Wed, March 16th, were, in fact, an ending contracting diagonal - as we had surmised in live chat - because the start of that diagonal has been exceeded lower. Now, it looks like we have another contracting diagonal lower. This suggests in the very short term the next move will be up, then down. A triangle is not a certainty. It is only a probability until it proves itself. Here's a video I made a commitment to provide, regarding the relationship between Elliott Wave Counting Decisions and Trading Decisions. Enjoy the video, and best of luck in the markets. Pseudo-certainty is pretending one is certain of something when, in fact, certainty is not possible or likely. I specifically coined the term "The Fourth Wave Conundrum" because when an Elliott analyst is in the throes of counting fourth and fifth waves, it is less likely one will get the count correct the first time. First, there was nothing untoward today to the down side. Voicing their 'opinions' some will say the market had a "consolidation day" after the large rise on the FED meeting announcement. Others might say "there was a failure to follow-through" and begin looking for a downward count. Others are "certain" we are going higher - but will not show how. Those that express their certainty are often involved with trying to sell a product: like a web-site subscription or a course with their super secret keys to unlocking the mystery of the trading universe. Few will just refer back to the Elliott Wave Principle, outlined by Ralph Nelson Elliott, and realize all the possibilities here. Next, in yesterday's chart, we showed how we have "three waves up" so far, which could be i, ii, and part of iii of an impulse. Or, it could be a, b, and part of c of a diagonal. Today we will show a slightly shorter term chart than the SP500 2-hr chart, instead focusing on the narrower 30 minute time frame, below. I am showing this alternate only so that you have a full understanding of how and why a precise call in the fourth or fifth waves may not be possible - at this point in time. I have not even shown this chart in the live chat room. So, suppose the down wave from 2401 is a three-wave structure as shown to ((A)), read as circle-A. So far, the up move has been limited to 78.6% of the down move, also in three waves, at this point in time. The Dow has already downwardly overlapped the Mar 10th (A) wave. The S&P has not. Suppose more downward wave movement is in store for the S&P500 tomorrow. We don't know that. We are just supposing. Then, it's possible the ((C)) wave down of a larger fourth wave triangle would form. But, and this is key, we are just supposing. There is nothing yet to say that the upward wave is over. So far, there has been little more than a 38.2% retrace of the March 15th high - which could either still be an internal fourth wave or an internal second wave of a continuing upward wave. In other words, it may be premature to label ((B)) upward as over. We could still very well go on to form 1) an upward impulse, or 2) an upward diagonal over the highs. And anyone who feigns certainty in such a situation is largely selling you cigar smoke in my opinion. You can go ahead and buy it, but there just isn't a lot there. The S&P500 today did make a higher high than the tentative ((A)) wave we posted in the prior chart. This means for now that the upward sloping trend channel remains in tact. (Remember, ((A)) is read as circle-A). Yesterday, the down wave again challenged the lower trend channel line, and extended to the point (a near exact 78.6% retracement) that we can give it credence as "either" a ((B)) wave, or a second wave, so both upward counts are currently noted. If it is ((A)), ((B)), then the structure will be of a diagonal. If it's ((1)), ((2)), then the structure is that of an impulse. As of the moment, I have no preference what-so-ever. However, the Elliott Wave Oscillator (EWO) has both turned green and is now above the zero line which should indicate a fifth wave in this sequence. The NQ futures have already made higher highs, while the Dow is currently lagging the S&P. And we are now at about only 146 candles, well within the 120 - 160 that are typical. On another note, we previously showed you this example of a 138.2% wave that we labeled b:3, and said the prediction in the Dollar Index was to be below the a:3 wave. As you can see from the chart below, as of the end of the NYSE session today, the Dollar did indeed trade today below that a:3 wave. So, you have seen a prediction made days in advance come true. Even though the over-all prediction came true, calling this downward wave in real time became a real challenge because several of the downward legs did not follow The Eight Fold Path. For example, the first wave down down from the top (wave i) was an expanding leading diagonal. In fact, yesterday, my "opinion" of what the Fed would do resulted in a turn-around possibility saying that it was possible we had a truncated flat. But, when the Fed suggested only two more rate hikes this year instead of three, the better definition of wave iii, downward occurred. (Interestingly, in the live chat room I suggested that exact possibility later in the day). Anyway, my purpose here has been served. I simply wanted to demonstrate a true 138.2% b:3 wave, as well as it's consequence. And that is now done. Again, this type of FLAT wave is called an Expanded Flat. It is not called by it's older name the Irregular Flat because there is nothing irregular about it. Expanded flats are one of the most common types of flats. They are seen often and regularly, so using the older name is a misnomer. But, the lesson still is being absorbed, as long as I've been at this, not to mix opinions - of any type - with wave counts. Here's hoping you have the best of evenings. Again, using the SP500 2-Hour chart (the same as yesterday), the critical conditions for a fourth wave have been met. 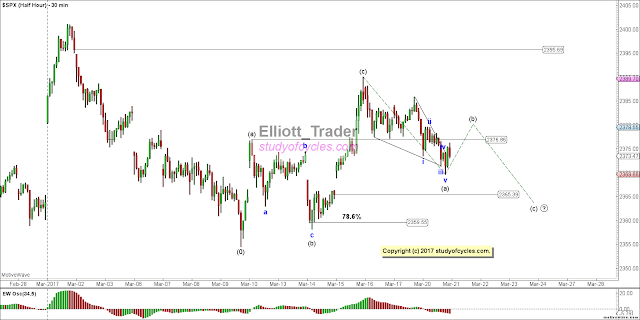 The chart is now out to 122 candles, within the suggested range of 120 - 160 candles, and the Elliott Wave Oscillator (EWO) has retraced back to the zero line, and slightly under. It can also be clearly seen that the lower trend channel line is being attacked to the down side, and we do not know that downward movement is over. (It's "possible" we are still getting an ending diagonal c wave lower or a more complex correction lower). At present, minuet (iv) has traveled back to the area of sub-minuet wave iv, but has not closed the upward gap there, and the wave currently has a 23.6% downward retrace on wave (iii). At this point, the only unsatisfactory aspects of a fourth wave are the amount of time taken and the "look" of wave (iv) compared to wave (ii). They look very much the same. Therefore, while we do not like to use alternates often, we must suggest that the down wave could still only be the a:3 wave of a larger fourth wave flat or triangle, so we have posted a flag regarding that on the chart. Alternate or not, we are glad we began looking for a correction just as others began their "how high the S&P can go" postings. Because fourth waves may not overlap wave (i), that will have to be the invalidation point for this fourth wave. Sometimes - high up in the wave sequence - fourth waves can get fairly deep. Speaking of invalidation, if the market decides to pull a "fast one" and get out of hand to the down side, within the live chat room I did post a clear alternate count for a possible top. But, there are some things I don't like about it, yet: primarily the proportionality. And so I will leave it in the chat room for now and only show it should this fourth wave not work out as expected. Why did I develop an alternate already? Because I am always looking for the count that would tell me where the current count is not correct. Keeps one on their toes.